Warsaw’s Nikki Grose goes up strong over Alyssa Wagner during sectional play Tuesday night at Concord. The No. 8 Tigers beat Elkhart Memorial 49-37. DUNLAP – Playing with poise and patience netted the Warsaw girls basketball team the program’s biggest postseason win in a long time Tuesday night. The veteran Tigers displayed composure and cool to knock off sectional nemesis Elkhart Memorial 49-37 in the opening game of the Class 4-A Concord Sectional. Smooth senior Jennifer Walker-Crawford produced a huge second-half performance to lead the No. 8 Tigers. Walker-Crawford scored 15 of her game-high 18 points in the final half as Warsaw pulled away to the victory after leading by just two points at halftime. Junior Nikki Grose had 11 points and nine rebounds and senior Lindsay Baker 10 points as Warsaw took the first step towards a sectional title. Warsaw’s highly-successful program, which owns a pair of state championships and 15 sectional crowns, last won a sectional title in 2004. The Tigers, who had been knocked out of the sectional by Memorial each of the last five years, improves to 20-1. Warsaw, whose last sectional win over the Crimson Chargers came in 2001, entered the sectional 4-0 versus the field. Junior southpaw Khadijah Moore, a Division I college prospect, had 15 points and a game-high 12 rebounds to lead the Crimson Chargers. The ultra-successful Memorial program had won nine straight sectional titles. Warsaw advances to play host Concord (6-16) in the first semifinal game at 6 p.m. Friday. 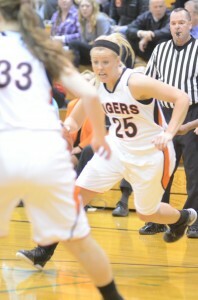 The Tigers defeated Concord 52-21 on Jan. 19 in Dunlap. Northridge (18-4) faces Goshen (14-7) in the second semifinal contest. The winners then meet at 7 p.m. Saturday for the sectional championship and a spot in the Valparaiso Regional on Feb. 16. Goshen defeated Elkhart Central 63-36 in the second game Tuesday night. The opener was a rematch from just two weeks prior when Warsaw snapped a 13-game losing streak to Memorial with a 39-32 victory on the Chargers’ home floor. The sectional affair turned testy and chippy at times, but the veteran Tigers kept their focus throughout. 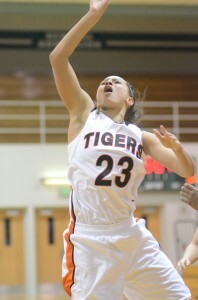 Jennifer Walker-Crawford scores two of her game-high 18 points for Warsaw Tuesday night. “We were definitely physically and mentally focused for this game,” said Walker-Crawford. “We have a lot of experience and have been in a lot of games like this. They tried to get in our heads, but we definitely were poised. The game was played at a snail’s pace for most of the opening half with long possessions in the half court. It was tied at 8-8 after the opening quarter and the Tigers led 18-16 at halftime despite shooting just 6-of-20 from the field and 4-of-9 from the free throw line. The Tigers took command in the third quarter by outscoring Memorial 17-7 in the pivotal period. Warsaw used a 7-0 run with Grose scoring four and Walker-Crawford netting an old-fashioned three-point play to take a 25-18 lead as Memorial went scoreless for a key 2:39 stretch of the stanza. Walker-Crawford scored seven clutch points in the third period and Brooklyn Harrison hit a huge running 3-pointer at the horn at the end of the quarter to make it 35-23. Memorial, which beat Warsaw in the sectional semifinals a year ago, got no closer than six points in the final quarter. Walker-Crawford netted eight points in the fourth stanza. “This is a tremendous weight off our shoulders,” said fifth-year Warsaw coach Michelle Harter. “I can’t be any more proud of the girls. They played team ball and executed the game plan so well tonight. “We talked at halftime about poise and keeping our heads. Our patience was a big key. We didn’t settle for the first shot. We got good shots in the flow of our offense and were patient to get good opportunities. When we do those two things (poise and patience) we are very difficult to beat. “Jen struggled some in the first half, but she came back strong in the second. She did what she’s been doing all year for us. She attacked and finished strong and she did a great job on defense. Our girls did a very nice job adjusting on defense. 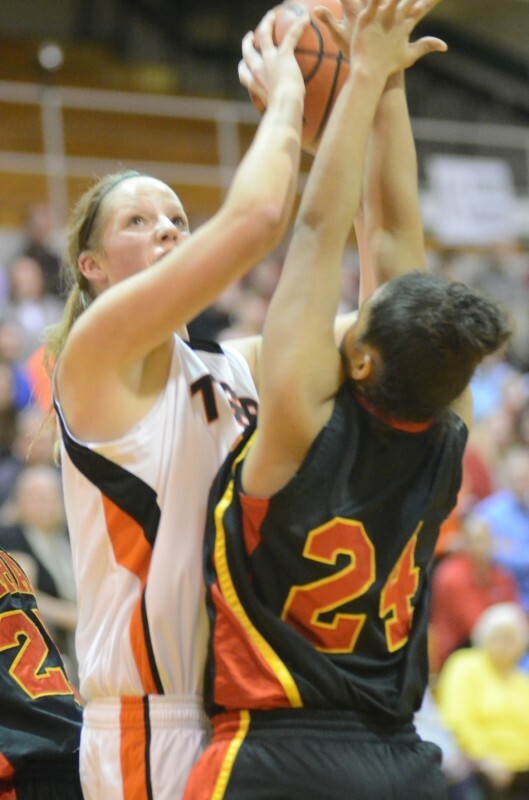 Lindsay Baker makes her way on a drive to the basket for Warsaw Tuesday night versus Elkhart Memorial. Moore, who was averaging 14.6 points-per-game, scored Memorial’s first two baskets of the game and then did not score again until a basket and free throw with 42.4 seconds left in the third period. Another big key was that the Tigers had just six turnovers in the game to 12 for Memorial. Warsaw also shot 10-of-17 from the field and 9-of-11 from the line in a much sharper second half effort. The Tigers outscored Memorial 13-7 from the line. Warsaw’s defense, which entered the game allowing just 35 ppg., was sturdy against the athletic and quicker Chargers. Memorial, which lost three of its final four regular-season games, shot just 7-of-19 in the second half. 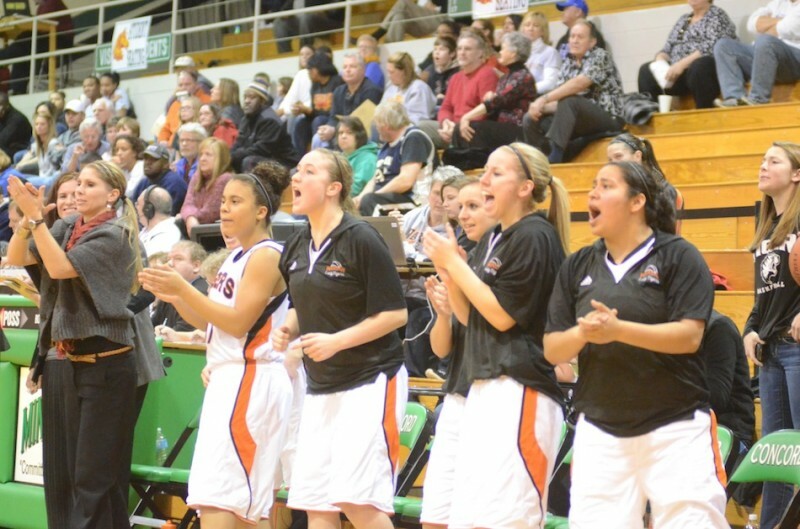 “We were in a perfect spot at halftime and had them where we wanted them,” said second-year Memorial coach Steve Scott. “But, the story of our whole season has been our trouble scoring and that was the case again tonight. We play 25-26 strong minutes and have a drought where we can’t score that kills us. That happened tonight in that third quarter. Harrison, a junior, had eight huge points for the Tigers, including a pair of treys. Eryn Leek scored two points as just five Warsaw players scored in the win. Monica Jones and Alyssa Wagner each had six points and Paige Newvine five for Memorial. The Chargers, who finish the season at 13-8, started four seniors Tuesday night in Jones, Wagner, Newvine and Victora Kyle to go with junior Moore. The Warsaw bench celebrates a play during second half action Tuesday night of a 49-37 sectional win over Elkhart Memorial.